The Luciano Family Web Site - Home Page - Travel Adventures in Colorado, Rocky Mountains, Italy, etc. This website documents the many travels and adventures of the Luciano Family in Colorado, the U.S. Southwest, Italy, etc. Consists of 12 pictures in 1 slide show and 6 videos. Consists of 18 pictures in 1 slide show and 4 videos. Fall colors and mountain views in the area.. Consists of 128 pictures in 6 slide shows and 1 video. Grammy and Grampy take Holt to the 9th Annual Garden of the Gods Rock Ledge Ranch Powwow. Consists of 12 pictures in 1 slide show and 3 videos. Grammy and Grampy take Holt to the Cheyenne Mountain Zoo. Consists of 15 pictures in 1 slide show and 2 videos. family trip to the summit of Mt. Evans (14,264 ft.). Consists of 80 pictures in 1 slide show. Cathy, Joe R., Amanda, Joe A., Holt and Zeus walked from Joe and Amanda's house (about 1/2 mile) to Old Colorado City. along the closed off Colorado Ave., the main street. The weather was just gorgeous and comfortable. Consists of 50 pictures in 1 slide show. All of the wedding pictures we have taken are now consolidated in this section. As we take more wedding pictures in the future, they will be added to this section. Bailey & Matt - July 14, 2018. Consists of 56 pictures in 1 slide show. Our grandson, Holt, from his birthday (6/17/2017) through "today". Consists of 90 pictures in 1 slide show and 10 videos. Consists of 76 pictures in 1 slide show. Consists of 88 pictures in 1 slide show. In celbration of their 3rd Wedding Anniversary, Joe. A. & Amanda travel to Iceland, Spain and Ireland. Consists of 233 pictures in 3 slide shows. with descriptions and links to newspaper and magazine articles and ads. Consists of pictures, descriptions and links. Consists of 39 pictures in 1 slide show. seleted photos from 10 photographers and over 2,500 original images (whittled down to a mere 311). Consists of 311 pictures in 5 slide shows. Includes a description of their route and cities they visited in Croatia. Consists of 188 pictures in 5 slide shows. Our old delpidated wooden deck gets replaced by a concrete patio. Consists of 25 pictures in 1 slide show. We take a mini-vacation to Cripple Creek, CO where we stay at the CARR Manor B&B and visit the old jail and the Victor open pit gold mine. Links to the latest information and news about Solar Electric Power. Also, links to informative web sites and solar calculators. We attend the ground breaking for Sunshare's first Solar Garden in Colorado Springs, CO.
We also see a Tesla Roadster and Chevy Volt electric cars. Consists of 82 pictures in 1 slide show. We take a tour of an Earthship in the Crystal Park area of Colorado Springs, CO. Consists of 36 pictures in 1 slide show. Consists of 45 pictures in 1 slide show. Consists of 140 pictures in 4 slide shows. Chuck (Jimmy's friend) visits us in Colorado Springs and we go th the Peterson Air & Space Museum and the Airplane Restaurant. Jimmy and Flo visit us in Colorado Springs. We travel to Denver, CO and Santa Fe, Chimayo and Taos, NM. Consists of 203 pictures in 7 slide shows. We attend the IUFOC in Scottsdale, AZ. It is the largest UFO conference in the world. There we meet with Jim Penniston and John Burroughs, witnesses to the RFI (Rendlesham Forest Incicent) of Dec. 1980 in Suffolk, UK. Consists of 52 pictures in 1 slide show. morning to exercise their bodies and Joe's new Nikon D60 camera. Includes 1 slide show of 28 pictures. visit to New York City, which included a bus tour of the City, taking in a Broadway play, and a game at the new Yankee Stadium. Includes 1 slide show of 39 pictures. Includes 1 slide show of 30 pictures. Includes 7 slide shows with a total of 66 pictures. to see the beautiful and amazing snow sculptures. Includes a slide show with a total of 84 pictures. Barack Obama - our first African American President. It was an historic and thrilling experience. Includes 3 slide shows with a total of 125 pictures and 2 videos. and replacement ourselves. See the story and slide show of our high-tech repair job. Includes 1 slide show with a total of 24 pictures. The excellent adventures of Cathy and Joe on our most fabulous Alaskan Cruise! glaciers, and some wildlife (Bald Eagles, Seagulls, and Salmon). Includes 9 slide shows with a total of 498 pictures (including panoramics), and 8 videos. Southwest of Colorado Springs. We stayed at Crestone, Colorado. and attended the 19th Annual Crestone Energy and Sustainability Fair. We would also see a Tibetan Memorial Park, visit the Shumei International Institute, and the Buddhist Stupa of Enlighenment. of The Great Sand Dunes National Park. Includes 8 slide shows with a total of 198 pictures including panoramics. Jimmy and Flo on their vacation to Texas and Colorado Springs. Consists of 198 pictures in 7 slide shows. Joe A. joined a group from UCCS for a trip to England. Many people from the group contibuted pictures to build 10 groups of slide shows. Consists of 4,810 pictures in 10 groups of slide shows. We visit the former homes of the Luciano's and Fennell's in Escondido, CA with Jimmy and Flo. Consists of 11 pictures in 1 slide show. We tour some very scenic parts of northeast Utah, southern Idaho and southwest Colorado with Jimmy & Flo. Narrow Gauge Railroad up through the Rocky Mountains in Colorado. Includes 3 slide shows with a total of 101 pictures including panoramics. Pictures of Joe and the Pikes Peak Fencing League at various fencing events. Currently includes 5 fencing events from the 2003 Toth Memorial Fencing Tournment to the 2005 North American Cup. Mom & Dad travel to San Diego to visit with Jimmy & Flo and see the sights.. Consists of 432 pictures in 13 slide shows. Mom, Dad, and Joe travel to Kansas City, Missouri to see the Yankees play the Royals. Consists of 42 pictures in 1 slide show. We travel the streets of Philadelphia by trolley and by foot. Beautifully quaint streets and historical buildings. Consists of 84 pictures in 1 slide show. Spectacular pictures of the 2004 34th Annual Lone Feather Council Pow Wow on the grounds of Rock Ledge Ranch just outside of Garden of the Gods in Colorado Springs. Consists of 130 pictures in 5 slide shows. Pictures of our ride up Pikes Peak with Joo Von (a visiting UCCS student). Consists of 58 pictures in 1 slide show. 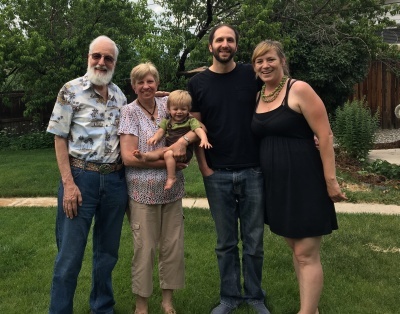 Pictures of family and friends visiting to celebrate Joe's graduation from the University of Colorado at Colorado Springs. Consists of 83 pictures in 3 slide shows. Pictures of Cathy visiting family and friends back East (Rome & Syracuse, NY). Consists of 19 pictures in 1 slide show. Our latest trip to Santa Fe, New Mexico and environs. New Mexico is truly the "Land of Enchantment", which is why we keep returning. We went this time with the intention of focusing our photos on the smaller cultural and architectural detail, but we were so overwhelemed by the fabulous deep blue skies and dramatic clouds, that we couldn't resist taking many landscape photos as well. We also have 2 new techniques that we are trying for the first time and are very excited about: an INTERACTIVE Panorama of the landscape at Ghost Ranch, and three "3D Animated Object Photos" of the Native American art works we acquired on this trip. Consists of 156 photos (including panoramas) with slide shows, plus one INTERACTIVE Panorama and three "3D Animated Object Photos". See our trip to the Black Hills of South Dakota with Jen Sweezey. The main objective and the highlight of this trip was to take part in the annual 6-mile roundtrip Volksmarch up Crazy Horse Memorial. Once a year, the public can hike up the Memorial and stand on the outstretched arm of Crazy Horse. We also toured Badlands National Park where Joe and Jen took a couple of 2-hour hikes on trails through the park. Their hiking enthusiasm continued in Custer State Park, as well as Jewel Cave National Monument. Consists of 211 photos (including panoramas) with slide shows. We travel 2 1/2 hours northwest to visit the wonderfully quaint, historical and snowy Breckenridge, Colorado. Famous for its ski resorts, Breckenridge hosts the annual Internationl Snow Sculpture Championship, attracting snow sculptors from all over the world. Consists of 20 photos with a slide show. We visit the wonderfully quaint, historical and artful Santa Fe, New Mexico. With a heavy Native American and Spanish influence, Santa Fe is filled with unique shops, art galleries, museums, and adobe, adobe, adobe! In addition to downtown Santa Fe, we took side trips to Bandelier National Monument, and San Ildefonso Pueblo, with a special and treasured visit to the studio/home of the potter, Juan Tafoya. Consists of 217 photos (including panoramas) with slide shows. We were very graciously invited to visit the studio/home of the potter and artist, Juan Tafoya, on the San Ildefonso Pueblo. We spent several hours visiting and talking with him, and witnessed and photographed the firing of some of his famous black-on-black pottery. Consists of 66 photos with slide shows. Our cross-country road trip back East with Jen Sweezey to visit family and friends, and do some sightseeing. See our touring of the Gateway Arch in St. Louis, MO, Niagara Falls, Canada, Cooperstown, NY and the National Baseball Hall of Fame, the Finger Lakes region and wine country in Central NY, Alexandria Bay, NY and The Thousand Islands of the St. Lawrence River, the "Field of Dreams" movie site in Dyersville, Iowa, the Badlands, Wall Drug, Mt. Rushmore, and Crazy Horse Memorial in South Dakota. Consists of 364 photos (including panoramas & animations) with slide shows. See our touring of Focus on the Family, Garden of the Gods, the Denver Capitol Building, the Stanley Hotel in Estes Park, Rocky Mountain National Park, the Manitou Cliff Dwellings, the U.S. Air Force Academy, Flying W Ranch, Joe's Dorm at U.C.C.S., the Broadmoor Hotel, Cripple Creek, Royal Gorge Park (the highest suspension bridge in the world), and the drive up Pikes Peak Highway including the summit - 14,110 feet. Consists of 83 photos with slide shows. See our touring of the U.S. Air Force Academy, the Stanley Hotel in Estes Park, Rocky Mountain National Park, the Manitou Cliff Dwellings, Flying W Ranch, Royal Gorge Park (the highest suspension bridge in the world), Garden of the Gods, and the drive up Pikes Peak Highway including the summit - 14,110 feet. Wildlife shots of marmots, and clarke's nutcrackers. Consists of 71 photos with slide shows. Our nephew, Robert James "RJ" Riggleman, and Grandma Szczesniak's visit in July 2000. See our touring of Rocky Mountain National Park, Pikes Peak Hill Climb Race Car Museum, U.S. Air Force Academy, Garden of the Gods, Flying W Ranch, Lone Feather Pow Wow, Cripple Creak, Mollie Kathleen Gold Mine, U.S. Olympic Training Center, and Manitou Cliff Dwellings. Wildlife shots of marmots, clarke's nutcrackers, chipmunk, and bull elk. Consists of 98 photos with slide shows. The Pow Wow of the Lone Feather Council on July 15, 2000 at the Fort Carson Field House in Colorado Springs. See beautiful, colorful pictures of the Native American dancers. Consists of 30 photos with a slide show. Snapshots of the family reunion in Granite Bay, California of the Luciano, Colantuono, Colentino, Fennell, Rivas and Cox families ("La Famiglia"). The Air Force vs Army football game on November 6, 1999, including photos of the air show, stadium, and game. Also, photos of the USAFA grounds and various aircraft. Consists of 24 photos, slide shows, maps, and links to the USAFA home page and web cam. Our visit to RMNP in September 1999, including many views of the fabulous Rocky Mountains and wildlife. Consists of 48 photos, slide shows, and maps. Our tour of Italy in June 1999, including: Rome, The Vatican, Pompeii, Sorrento, Capri, Assisi, Ravena, Venice, Burano, Pisa, Florence, and Siena. Consists of 142 photos, slide shows, itinerary, narrative travelogue, and tour map. Stuff that used to be here, but is now there! LIVE Web Cams in Colorado, New York, Italy, etc. See live pictures of various locations in Colorado, New York, Italy, and Pakistan.